When you visit a crematorium ceremony, you may not know what to say in that situation. It is not easy to take the person out of the situation. Your solemn condolence message can act as an ointment in a deep cut. No words and sympathy can fill the empty space of the bereaved person. So, it is your prime responsibility to stand by the side of the bereaved person as a good friend, colleague, neighbor or relative when a person he/she loves dies. It is a daunting task to express your sympathy in words when you are conveying a commiseration message to your friends or relatives. Some people jumble up with their words in nervousness in such situation. They reveal unnecessary words, which hurts the feeling of the bereft person. So, choose your words correctly when you are conveying condolence message. Communicating in a sympathetic tone with the person may help the individual to endure power with moral support. Avoid starting conversation that is less respected for the demised person. As a friend or relative, show your concern for him/her and make the person feel comfortable. Confront and communicate with the person rather than avoiding or running away from the situation. You never know that your sweet words may console the person’s aching heart. Try to offer your sympathy and make the person feel that you are always the individual. Always keep your tone consoling and low. Do not repeat the same sentence several times. If the bereft person wants to share the feelings with you, pay heed on the words. Sometimes sharing pain can be the best medicine for an aching heart. Provide your shoulder when the individual wants to cry. These ways may help the individual to get respite in the worst situation and take the person out from the agony. Death of a person makes an ambience adverse and mournful. Still, you need to support your friend with a gentle gesture, warm hug and sweet words. If you don’t know what to say when someone dies then keep some condolence messages in your mind. A body dies but a soul is always immortal. Do not lament because he is always with us and God will keep his soul in comfort and peace. Accept my solemn condolences. Sorry to hear that you have lost someone who had special importance in your life. Please accept my solemn condolence. May her soul rest in peace (RIP). Amen! I lost my words and really don’t know what to say in this painful situation. No one can take place of the person you lost in your life but never feel alone because I am always with you. I will pray to God that may the Almighty bless his soul and help you to fight with this difficult phase in life. My deepest sympathy goes out for your family and you. It is my only prayer to almighty to give you strength and power to support your family. Do not hesitate to call me whenever you need my help. I never expected that I have to face you in this situation. Seriously, I don’t have any words to speak but just want to say heartfelt condolence to your loved one. A human being is a mortal being and it is an inevitable truth that we all have to get mixed with the soil one day. It is hard to accept but my daily prayer would include power, strength, and courage to move on after your loss the most important person in your life. Heartily condolences for her. Life is like the rids of the piano. The white rid denotes the bright part ant the black rid talks about the dark phase of life. As you are standing on the black rid of the situation, so, I will request you to control yourself for your family. My prayers and support are always with you. I convey my condolences to you in this melancholy situation. He was the most loved and kind-hearted person who will be immortal in my heart forever. It is impossible for me to forget this dark day ever in my life. I believe that grief can be hard but our happily spent memories with her will help us to cope up. Warm regards and condolences. RIP! May the beautiful memories of your loved one bring a smile on your face during this hard time in life. My heavy heart wants to convey sincere condolence. I can understand your present situation and your agony in the heart. I cannot fulfil your loss but will be glad if you share your pain with me. She will be sorely missed by all of us. Our prayers are always with you and her. Deep condolences. Please accept my honest sympathy and condolence for the loss of your loved one. I still cannot believe that she is not with us. Her absence will be missed forever because she used to be an important person in our life. Person departs from earth but never leaves us completely. She is still alive in our hearts. She will never be forgotten. We pray for peace for her soul. I cannot fathom how painful this situation is for you and your family. Please do not feel alone and be assured that you are in my prayers forever. I offer my good wishes, prayers, thoughts and condolences in this dark period of your life. I regret your loss and heartily sorry for you. Losing someone special is never an easy thing in life. Still, I will request you not to lament because your tears may hurt the kind soul of the special person who is resting with peace in heaven. Do not fill your heavy heart with dirge and agony. Try to recall all the sweet memories of the lovely person, your tears will dry up soon and you will gain the power to fight with the situation. May the kind Heavenly Father be always with you. Amen! People get mixed with the soil but their memories and works always remain on this earth. It was his kind and noble deeds that we will never forget such a nice person ever. Let your tears wash down your pain and let us pray and covey tribute to his soul. May the soul find comfort and peace in heaven. Amen! Just give me a call, I am always with you whenever you need me. I would request you to accept my firm condolence. I have a few words to say in this situation but I will pray from my heart that you and your family get the fortitude to bear such a great loss. Heartily condolences with grief and concern. I am honored and privileged to be part of her life when she was alive. I want to bid her farewell with tears and white flowers. May the angels and positive power guide the soul in heaven. Amen! No words can suffice the heartfelt sorrow that I want to express for your loss. I request you to accept my condolences. I promise you to be your side always whether I am close or far from you. His demise is a great loss for all of us and the people who know him. Accept our regards and condolence. In this sorrowful moment, have faith in the Almighty. God will keep the noble soul of your loved one in comfort. May our prayers ease the pain of your heart. We only have prayers and the fond memories of our dearly departed person. When his soul is summoned to heaven may guardian angels guide him and give him the endurance power to bear the loss. Time flows like ocean water and never waits for anyone. Do not lament for this moment because time is the best medicine for every pain. I know that she will never come back but we cannot deny the inevitable bitter truth that birth and death is not in our hand. Lots of prayer and love for the departed soul. I wish I could take away all your agony and despair but I am helpless. I strongly apologize you because I can only offer condolence, tears and moral support from my side. Please do not feel hopeless and alone. I am always with you and your whole family. My good wishes and prayers are always with you and the special person you lost. I pray for the solace of the soul. Do not hesitate to remember me whenever required. May his soul rest in eternal peace. His memories cannot be erased from our lives. I will miss him every time in my life. His unexpected death made us speechless and we really don’t know what to say in this pathetic time period. I convey my deepest condolence. My prayers and support are there with you in this tough time. Most devout condolences for him. There is a life after death and do not worry God is taking special care of your loved one. You cannot fight with destiny but you can pray for the solemnity of the soul and her rebirth in a good family. Heartiest condolences dear. There are no such words or messages, which can take your pain away right at the moment. But remember that I am always there to provide my shoulders so that you can cry. You can talk to me always whenever you want to share anything with me. Please share all your pain with me. We all are shocked and mournful by hearing the news of his demise. He will always be in our heart and with our prayers. Heavy heartily condolence. Dawn comes after every dark night. Have faith in the heavenly power he will relieve you from all the agony and pain you are facing after losing your loved one. Just pray for the solace of the soul as I am doing the same. Pious remembrance, honor and homage in the memory of the special person who is no more with us. His gentle nature will be memorable forever. My profound sympathies for you and your family at this hard time. Please take care of yourself and family in this crucial period. Deepest condolences. I am sure that he is resting in the arms of God like an angel. My prayers will always be with him. Earnest condolences. We are deeply distraught by the loss of your loved one. We will surely miss him but he is up with God and watching us. He will be alive in us forever. May God be with you. Always remember that God is our creator and he has fixed the perfect time to liberate our soul. I know it is tough to understand when you have lost a special person but time will give you the endurance power. A gentle soul among us ascended to heaven by leaving pain and anxiety in this earth. We bid goodbye to our friend with condolences. Please share this moment of grief with me recalling the sweet memories of your loved one. I solemnly pray for the comfort of the pious soul in heaven. Please be strong for your family in this miserable period. You will always find me and my family beside you in your high and lows. Condolences for the pure soul. Saying goodbye to a special person is heartbreaking. I wish her soul enjoy the delight of heaven by sleeping on the lap of our heavenly father. Amen! I have very inadequate words to express my sorrow for the loss of your loved one. Please accept my profound condolences. Rather than lamenting hard, we must cherish the aesthetic memories she has given to us. I pray for peace for her kind soul. Her presence made our life fragranced like the smell of Jasmine. It is very hard to forget her reminiscences. Serious condolences. With the heartfelt sympathy on the passing of your loved ones, I wish my prayers get answered and relief you from the suffering of such an unexpected loss. Wishing you to get gratified from the pain you are facing in the present turbulence of your life. Our reflective sympathy and condolence for your great loss. I cannot express how sorry I am for the demise of your special person. My prayer, support and love are always with you. Perhaps he has become the stars and shining brightly in the dark night. He can see us from far apart. Do not make your heart heavy his soul is always with you. A noble heart has stopped beating and her soul has reached to Almighty. I pray for the peace and tranquility of her soul. Amen! I know that the soul of the lovely person has ascended and not among us anymore. But I can feel his presence and I am sure that his blessing is always with us. Yes, it is true that neither you nor I were prepared for this difficult situation in life. It came like swift wind and mashed up your life without providing any notice. However, we have to move on and pray for the departed soul. I am deeply saddened by your loss. May the Heavenly Father stand beside you in this tough time. I will be very glad to be with you whenever you need me by your side, so never feel alone. Any words cannot be adequate in such a mournful moment. Still, I will guide you not to lament tears but try to recall the happy movements you lived with the person you lost. At this moment my tears and white roses can only be the tribute to his memory in the graveyard. Solemn condolences. May her journey to heaven be joyful with eternal bliss. I pray tranquility for the kind soul. You can express these words before or after the funeral. You can also send these condolence messages via sympathy card to your friend or relatives in that mournful situation when you are far. It may be awkward for you to reveal your feelings for the deceased. Suppose you care about someone who lost a pet, reveals your sympathy by saying, “I am sorry about the passing of your sweet puppy. We all will miss him forever.” This will be enough to say. 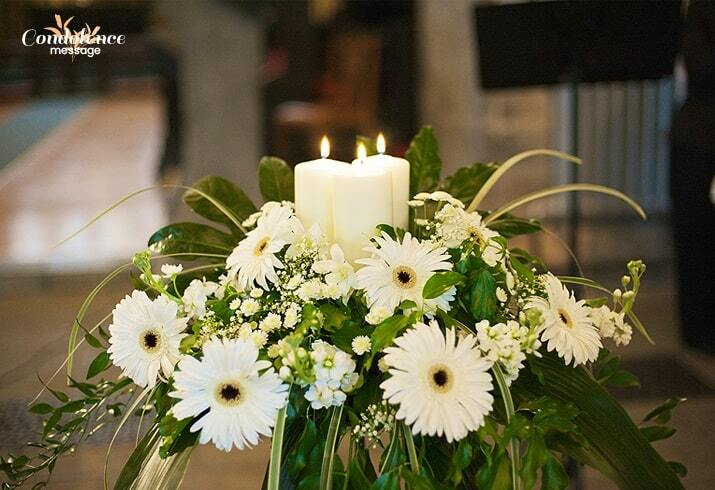 Thus, sending these sympathy messages can help you to reveal your care and concern for the bereaved and family.